Mum and Dad are about to celebrate years of happy marriage together. Commemorate the occasion with a very special gift. Now that you know these anniversary basics you can hit the shops! Mum and dad may have bankrolled you through university. They may still accommodate you at home with plenty of free washing and food thrown in for good measure. There is no doubt that after all their hard work they deserve a special gift. Why not go that little bit further to make it memorable? 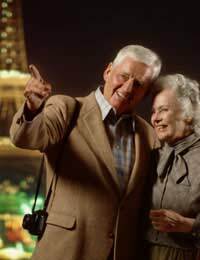 If your parents got engaged in somewhere like Paris why not arrange for a return visit? Make a booking on their behalf – researching the most romantic hotels and restaurants and give them an all expenses paid weekend away. This is a particularly impressive gift, especially if they were not able to afford such a treat the first time round. If their first date or engagement was at an expensive restaurant, or if they have simply always wanted to dine somewhere special, get that reservation made. Depending on the restaurant this may require some forward planning so don’t rest on your laurels and leave it to the last minute. It is possible to give the reservation team your credit card details so your parents can throw caution to the wind and order whatever they choose without the responsibility of paying for it. This makes for a nice surprise at the end of the meal when they realize that everything has already been settled. If you budget is a little on the small side, expensive dinners or weekends away may sound like a tall order. However, if your creative side is fairly strong, use it to create something equally, and if not more, memorable gifts. Collate and present a photo album of memories to mum and dad. It’s unlikely that they would have ever put together anything like this and they will be truly touched. Get all the family involved, inscribing special messages and contributing their own memories of the happy couple. This could be a mammoth project but the pay-off is two happy and possibly very emotional parents! If they have repeatedly expressed interest in it, or if you think they will be particularly keen, arrange for mum and dad to renew those wedding vows. In this day and age, where divorce is increasingly considered the norm, the fact that they have managed to stay together is cause for some serious celebration! Your gift might be a monetary contribution to a renewal vow fund, the pre-reservation and payment of the vow venue or perhaps actually secretly planning and arranging the day itself. Vow renewals are generally less lavish than a wedding. There is no reason to have a gift registry, a stag or hen party or quite such an expensive ceremony. However, there really are few rules in existence. If mum and dad could only afford a frugal wedding before, and they are now in the position to splash out, then why not make this a huge celebration, with all the trimmings? Invite the closest family members and friends along and make it a special, intimate affair. There is nothing wrong with playing it safe. A large bunch of flowers and a bottle of quality wine are presents that your parents will be delighted to receive. If you cannot think of anything else to give them, these are the last resort presents. If the anniversary is a year with a special theme, like pearl or gold, get them a gift that contains an element of this. A pair of his and her watches or a commemorative necklace will fit the brief. Whatever your budget there are lots of gift ideas out there. Buy them a weekend away or a golden watch. Create a scrapbook of memories or arrange a wedding vow renewal. Just choose a gift that you think they will appreciate and make sure that the day is all about them!